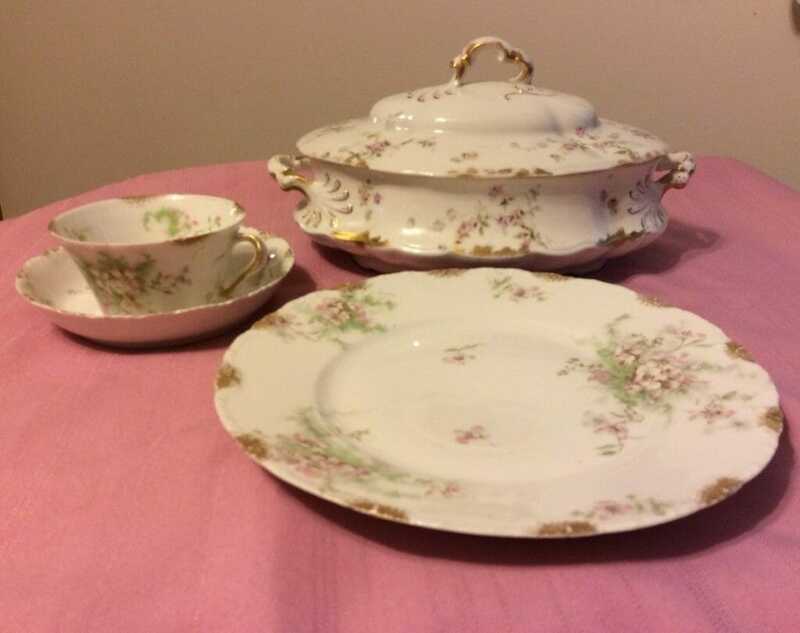 My great-grandmothers Haviland china begs to be used. Get out your good dishes or your grandma’s china. Iron your damask tablecloth, the one you store away for the nice occasion that never comes. Invite your girlfriends or your Bible study group. That’s your starting point. Make your signature dish or use my sugar cookie recipe below. Provide your favorite blend of tea and/or coffee and you are ready to make it happen. That’s what one of my bible study gals did. Our two women’s bible studies took a breather for the summer, but we started to miss our time together. Plus some new faces had appeared, and we wanted to provide a social time for them to work in easily and gradually into our group. Gloria has a lovely lakefront home ten miles out on the country. She set the table with her seldom used china, made quiche and cheese strata, and spread her kitchen island with a salad bar. I passed a plate of sugar cookies and peanut butter cookies, and of course, we had coffee. Then we lingered and lingered and lingered some more. Three hours for a lunch? Why not when you love being with your sisters in Christ. The natives talked about name places of yesteryear. We moved to common topics like our memories of handwriting classes and schools moving toward eliminating cursive writing. (Believe it or not, there were mixed opinions!) We talked about the exciting ways we see God working in our midst. And we enjoyed the serenity of being ten miles away from the demands of our lives. The afternoon talk brought back my own set of memories. When my girls were young, two other minister’s wives and I would put our kids on the bus the first day of school then spend our morning over coffee talking and praying, wiping a few nostalgic tears, and talking some more. What a great way to start the school year. One problem. We forgot the cookies. School has already started in some areas and fall bible studies are right around the corner. You don’t have to be a whiz cook to be hospitable. Just put on a pot of coffee or the tea kettle, pick up the phone and invite those special ladies in your life for an hour of talk and prayer. Buy cookies if you must but these sugar cookies are really simple and quick to make. My girls dubbed them “Mom’s Almost Famous Sugar Cookies.” They have a unique blend of both lemon and vanilla extract. Instead of using a fork to make the crisscross design, use a metal meat mallet if you have one. Cream together the shortening, sugar, eggs and extracts. Stir in dry ingredients until well blended. Press cookies with fork dipped in sugar in a crossed pattern (like peanut butter cookies). In one week, I was the happy recipient of the overflow of thriving gardens. 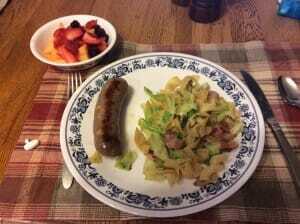 Gloria gave me part of a huge head of cabbage and some new potatoes. Mike met me at the door with two quarts sized bags of green beans already washed and cut. Alice (oh, God bless you, Alice!) gave me a bowl of black raspberries from the bushes on her hill, apologizing that this year’s crop wasn’t so plentiful. But she had enough to share with us! Last year’s corn crop was so plentiful that some dear soul would leave a bag of sweet corn on my doorstep, ring my doorbell, and then run away. Did they think I was going to turn it down? Whoever it was, thank you, thank you, thank you. Can I make you some homemade bread? Every week, the table beside our congregation’s coffee stand is filled with tomatoes, peppers, and zucchini free for the taking. One person’s overflow provides the needs of those who have not. The generosity extends beyond harvest and food. 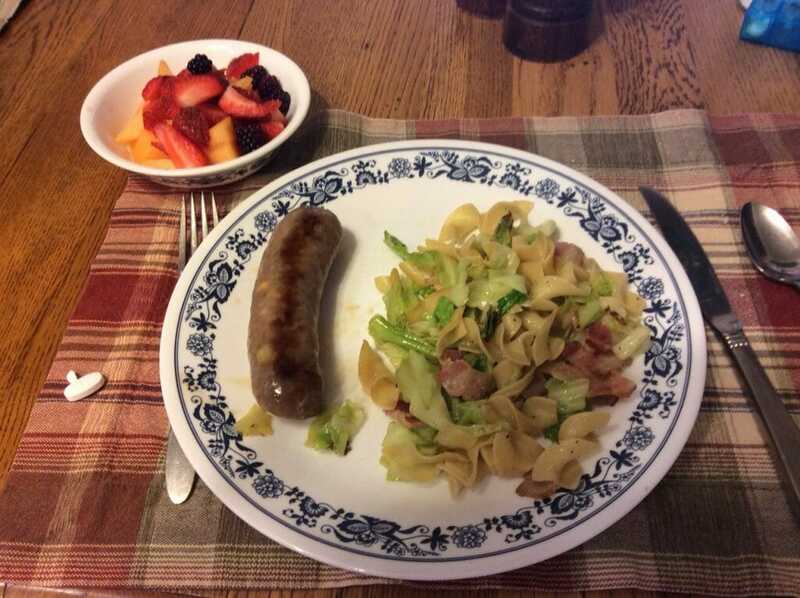 As couples reach retirement and our tummies start to shrink, we’ve started to share items we can’t eat up by ourselves. Mike and Anne split a bag of Gala apples with us and we whack off a hunk of our watermelon or cantaloupe to give to them. When our daughter zipped home from China only to leave two days later for her new job in Iowa, ten church people showed up to load her trailer. At the other end, a dozen people from the church near her new apartment converged to unload her possessions in a record twenty minutes. We each share what we have and no one is in need. That sounds like the early church to me. 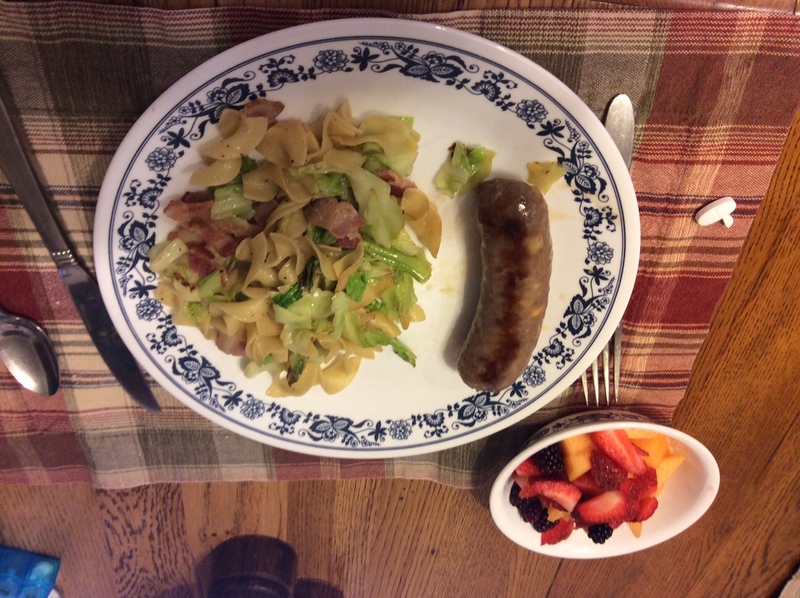 My Friend, Caroline from Ohio, shared this recipe for Fried Cabbage and Noodles with me. It quickly became a family favorite. When I decided to share it with you, I had to make it so I could give you concise measurements. You can easily adapt it to your own tastes. The cabbage cooks down quite a bit so I always tend to add too many noodles. Maybe you can find a fresh head of cabbage from a summer garden to enjoy this summer treat. Meanwhile, dice bacon. Fry until the bacon is not quite done but has emitted enough grease to coat the bottom of your skillet. Add cabbage. Stir fry until the cabbage has wilted down and is crisp tender, about 5 minutes. Add noodles, season with salt and pepper, and stir 3-5 minutes. 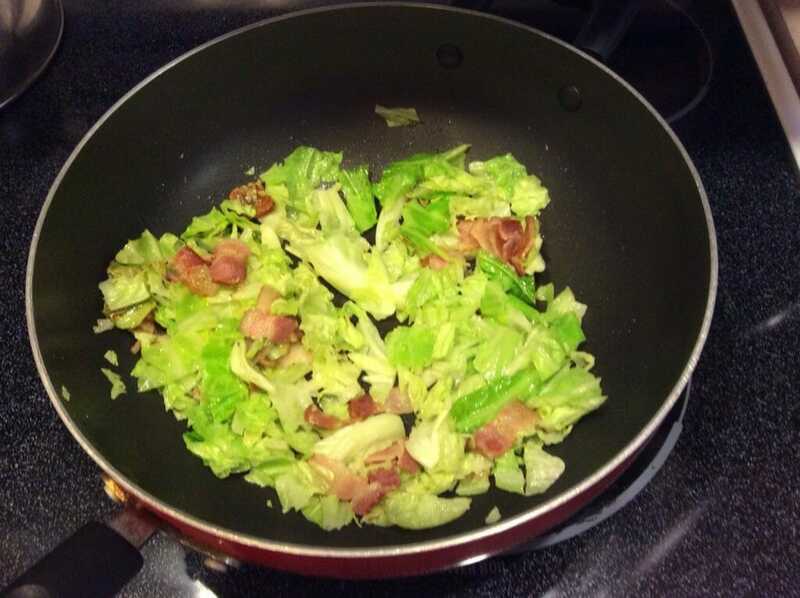 Cover, turn fire to low and cook for about 2-3 minutes or until the cabbage is tender to taste. Do something special for your hard working Vacation Bible School staff. Create a Hospitality Room that provides healthy snacks and drinks, and a pleasant relaxing environment. You can base your VBS program on a rotation schedule so staff members can take a break during the three hour sessions to get a bite to eat, put their feet up, and have a chance to interact with each other. Our church found that the “Break Room” provides a great place for workers to fellowship and relax. It’s a wonderful way to show the teachers and workers that we appreciate their ministry to the children and we care how they are doing throughout each evening. We ask a different couple to play host and hostess each night who bring a variety of healthy and sweet snacks and visit with workers, offering encouragement and prayer if needed. Our main Break Room coordinator fills an ice chest with soft drinks and bottled water and prepares a pot of decaf coffee. We tried to offer more substantial snacks the first night, like pulled pork sliders or chicken salad sandwiches so those who haven’t had a chance to eat supper will have something more substantial to eat. This year, my special friend, Makayla Wainman, brought food for Thursday night. 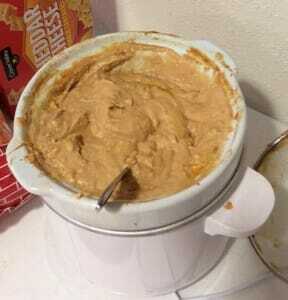 She made an awesome bean dip that she has graciously given me the recipe to share with all of you. In addition to a VBS hospitality room spread, this easy to fix dip would work well the next time you need to provide a snack for a teen or adult gathering. Makayla doubled the recipe and put it in a small crock pot. Don’t forget the tortilla chips! A great snack to feed the adults during a busy week of Vacation Bible School. Don't forget the tortilla chips. 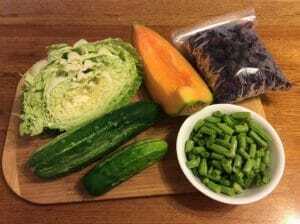 Place in crock pot. Heat on low for 2-3 hours until the cream cheese melts. Stir well and keep warm. With the cool rains and abundant sunshine this summer, my basil plants are over running their beds! 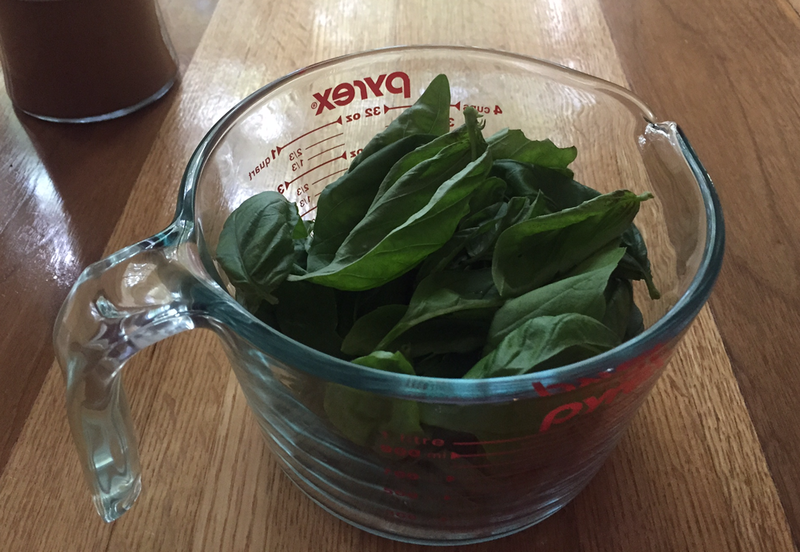 Here’s a healthy and yummy solution to use up some of the excess basil in your garden. Basil Pesto can be added to so many dishes. It goes quickly in our house. Add it as a spread to bread or toast. Add it to spaghetti or any pasta dish. We especially like it spread on top of grilled chicken. How do you use this delicious fresh addition to your cooking? 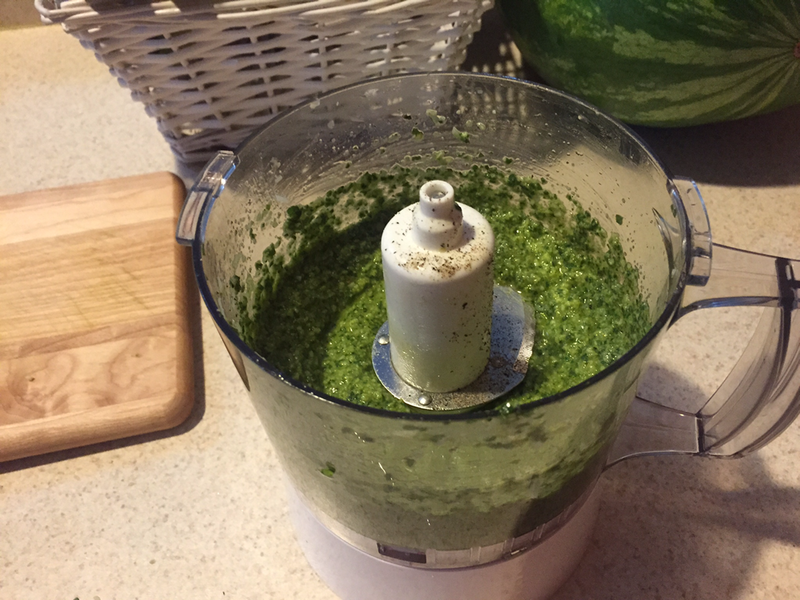 Place all ingredients except olive oil into a food processor. Pulse ingredients on low until everything is starting to get the proper consistency. Pour in the olive oil SLOWLY. It's important that this is done slowly since olive oil can become bitter and emulsify if processed too quickly. Once processed remove from the processor and put into a glass storage container such as a jar. Add a splash of lemon juice and stir. Do a taste test and add a little more salt and pepper if needed. This should keep in the fridge for about a week but you can also put it in the freezer and it should be good for a couple months.